Give the Browns this: for a team mired in a perpetual quarterback controversy, they manage never to have the same one twice. With Josh McCown reportedly out for the year, the newest debate is between Austin Davis, who wasn’t even with the team in training camp, and (once again) Johnny Manziel, who Mike Pettine appears to hate with every fiber of his being. According to Cleveland.com, McCown is believed to have suffered a broken collarbone in last night’s incredibly Brownsy 33-27 loss to the Ravens. He was tackled hard by Timmy Jernigan with 2:12 left in the third quarter and sprinted off the field in pain. That’s around when the crowd started chanting Johnny! Johnny! Though Manziel was active, unusual for a third quarterback, it fell to new No. 2 Austin Davis after McCrown tried and failed to gut out another series. Davis led a game-tying touchdown drive. So what now? If McCown is indeed done for the year, do the Browns go with Davis, who looked quite good in limited relief? Or do they go with Manziel, who they’ve invested more in and who hasn’t yet had a prolonged opportunity to show if he’s capable of leading a team—but who manages to keep shooting himself in the foot each time he does get a chance? Pettine isn’t saying. In the end, does it even really matter? 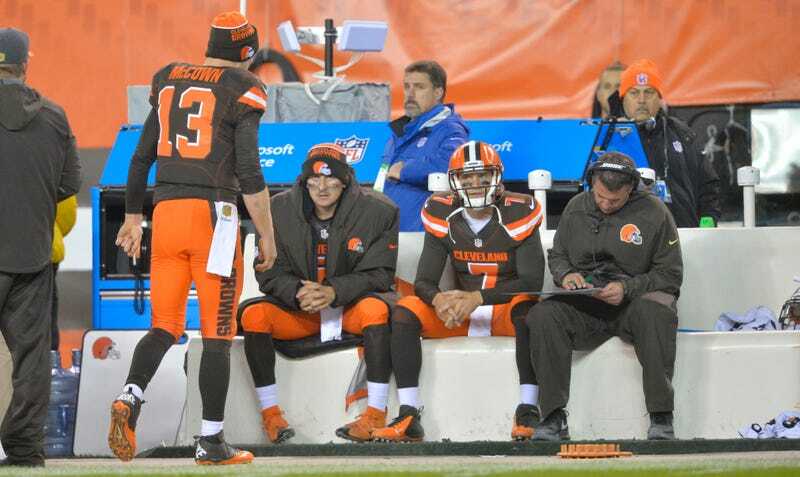 A Browns quarterback has the job security of a Defense Against the Dark Arts teacher.